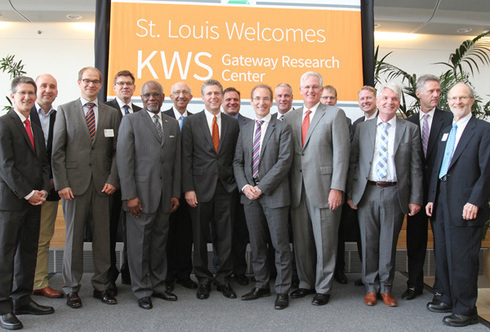 Leading global plant science company KWS has selected St. Louis as the home of its new North American research facility. Yesterday, Gov. Jay Nixon joined company officials from KWS, leaders from the Donald Danforth Plant Science Center, and local economic development partners at the BioResearch and Development Growth (BRDG) Park to announce the expansion, a capital investment of $13.7 million that is expected to create 75 new, high-paying jobs. Headquartered in Germany, KWS has been breeding crops for temperate climates for more than 150 years, providing seed cultivation for sugar beets, corn, grains, feed, oil and protein plants, vegetables, potatoes, and other related activities. The company will establish the KWS Gateway Research Center in the Danforth’s BRDG Park. KWS plans to immediately begin the process of renovating more than 19,000 square-feet of space inside the BRDG Park’s Building One to fit custom lab and office space, in addition to constructing a dedicated greenhouse complex adjacent to Building One. To read more about KWS’ St. Louis expansion plans, please click here. You can also watch a video of Gov. Nixon welcoming KWS to the Show-Me State at this website. For more information about Missouri’s growing bioscience sector, visit this link. Help us share the new through Facebook and Twitter! Are you a growing company looking to expand or plant roots in the Show-Me State? Check out all of the resources available through the Missouri Department of Economic Development.